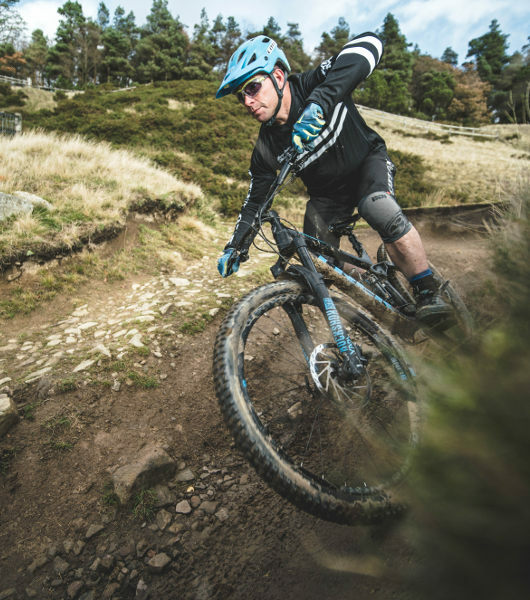 This is a slightly more challenging ride that offers four brilliant descents ranging from wide grass routes to tight, exciting singletrack. 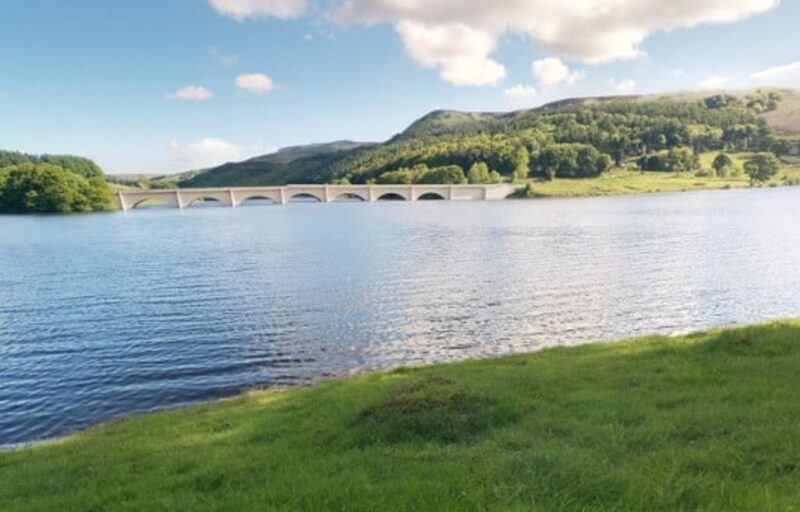 The route does have some tough climbs that can test a rider if they don’t pace themselves, it is best to take it steady putting the effort in on the climbs and descents while recovering on the flats. Hope is positioned just before the halfway mark making it a perfect place to stop for some food and drinks before starting the second half if you need it! 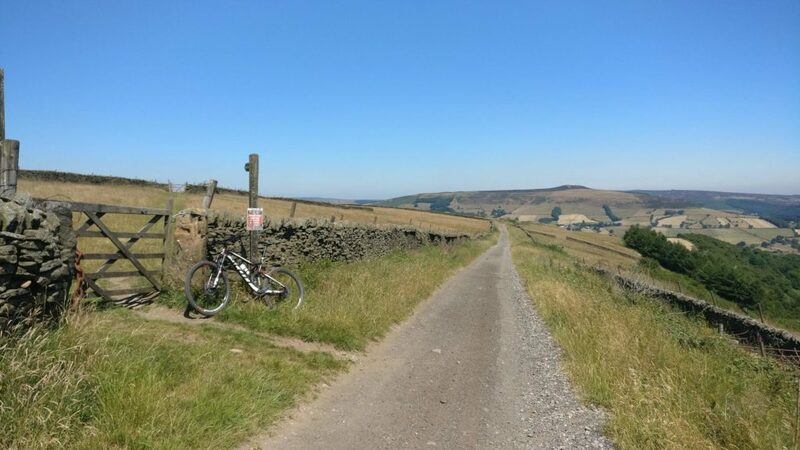 The route starts at the Bike Garage in Bamford before a short but steep road climb to Offerton, after 1.7 miles and roughly 380ft of climbing the route moves onto a bridleway climbing up towards Shatton Lane. 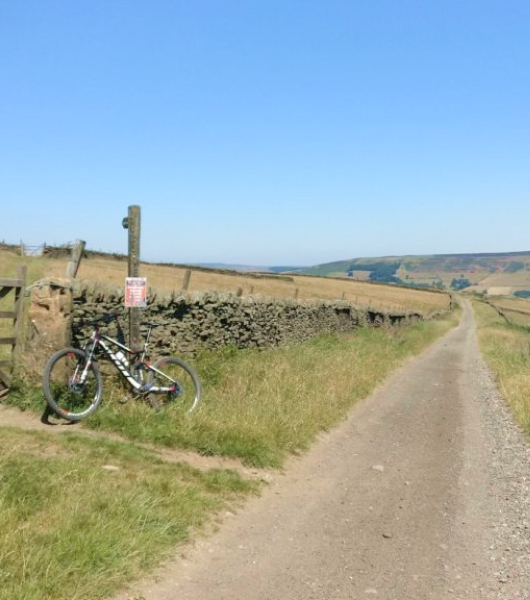 This bridleway works along the hillside through an open field before joining up onto Shatton Lane, a gravel road providing brilliant views to the right with a few gates along the way. 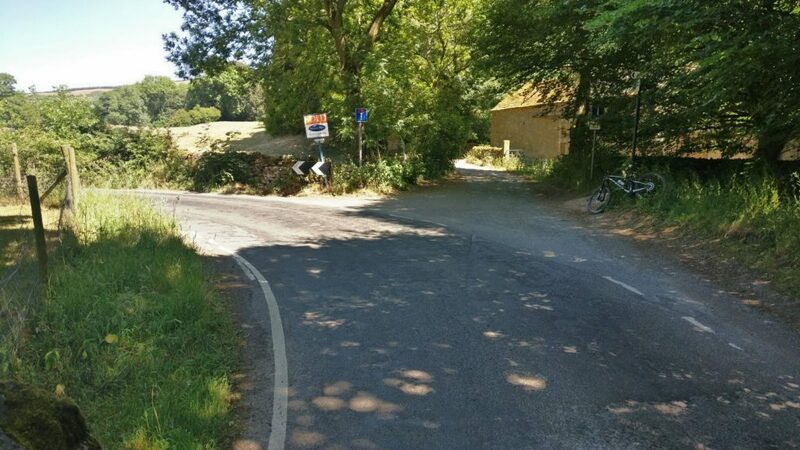 This bridleway is followed for roughly 2.2 miles before turning left at a gate with a large chain on it, keep an eye out for this as it is very easy to fly past. Top of Brough Lane split for Bradwell Edge. At this point the route has its first major descent from Bradwell Edge down to Bradwell. 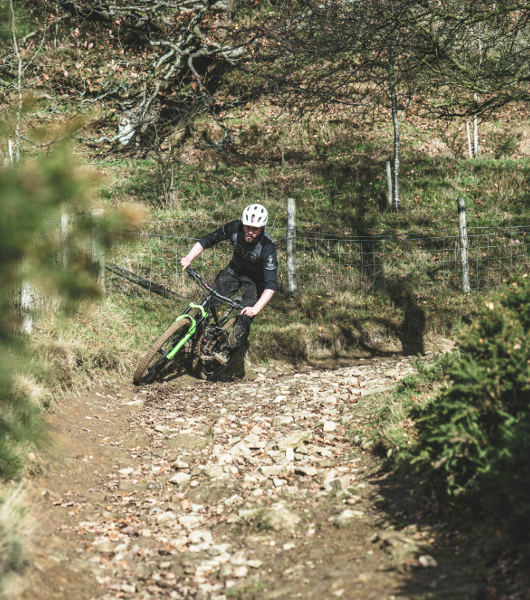 It is a 0.5 mile route dropping just over 350ft, it is a fairly tight singletrack descent that is a little overgrown in some places and has a couple of gullies you need to keep an eye out for. 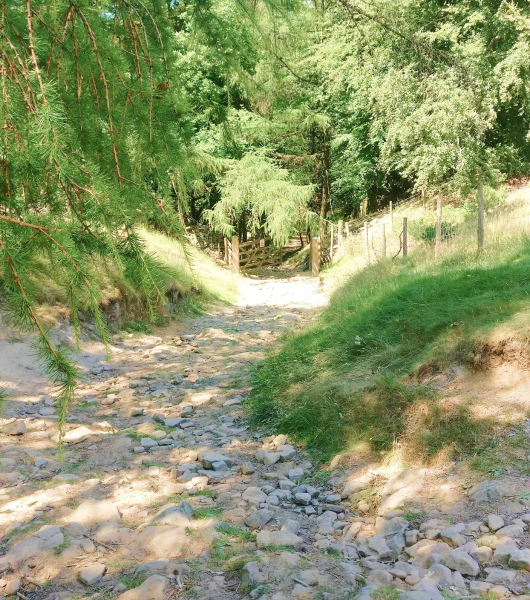 Once at the bottom of this descent the route shoots through a straight offroad section that comes out onto a farm track before taking a left and finally dropping into Bradwell. From Bradwell the route joins onto the bridleway that takes you behind and through the Breedon Hope Cement Works, this is a cool industrial area that has a number of bridges going over the top of the bridleway and gives it quite a unique feel, just be aware of vehicles at the crossing points because this is an active worksite! After the bridleway joins onto Pindale Road turn right and follow it for roughly one mile down into Hope, here you can stop for some food and to fill up your drinks. 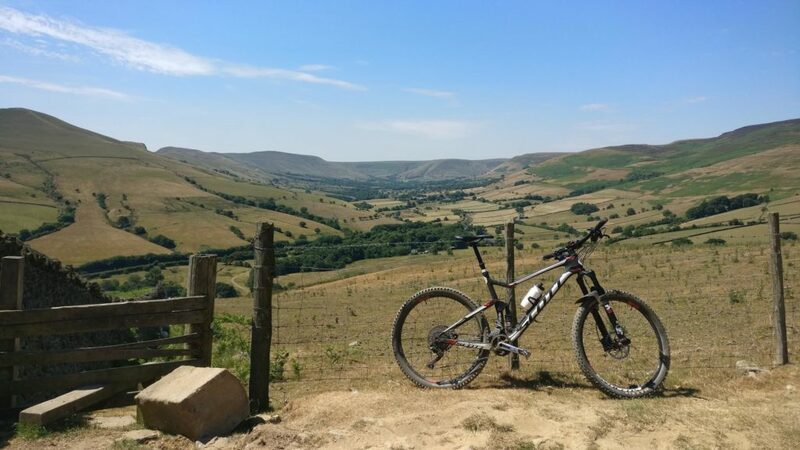 From Hope the route follows the Edale Road for almost a mile before joining Fullwood Stile Lane and then going on to the Roman Road, the turnoff is just after a narrow bridge and continues in the direction you are riding up towards Win Hill. 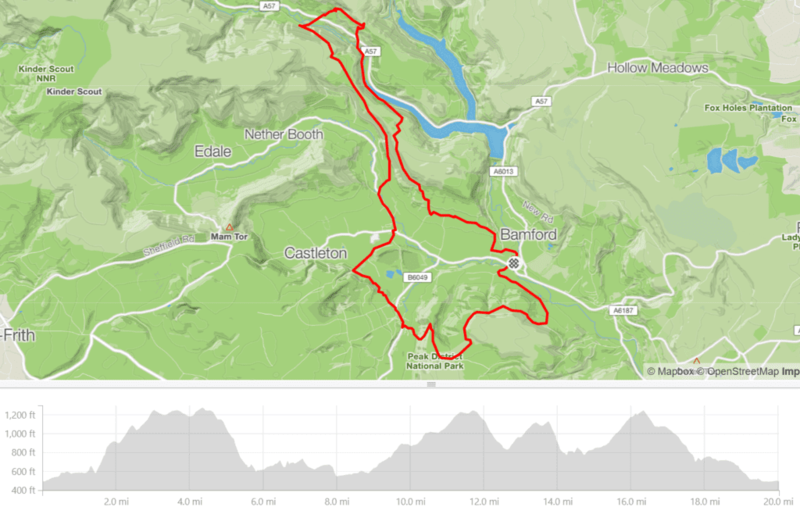 The Roman Road climb is about a mile and a half long and climbs just over 250ft before taking you to Hope Cross. At Hope Cross the route follows straight towards a descent called spud alley (Google Maps calls it the Roman Road), this is one of the longest descents on this route. Spud Alley is a wide rocky descent with thousands of small lose spud sized rocks that move making the lines different each time, it is a tough descent but as long as you keep your speed and look out for the smoothest line you can get down fairly smoothly. The descent is just over half a mile long and drops you almost 300ft down to a small road that leads to the A57. 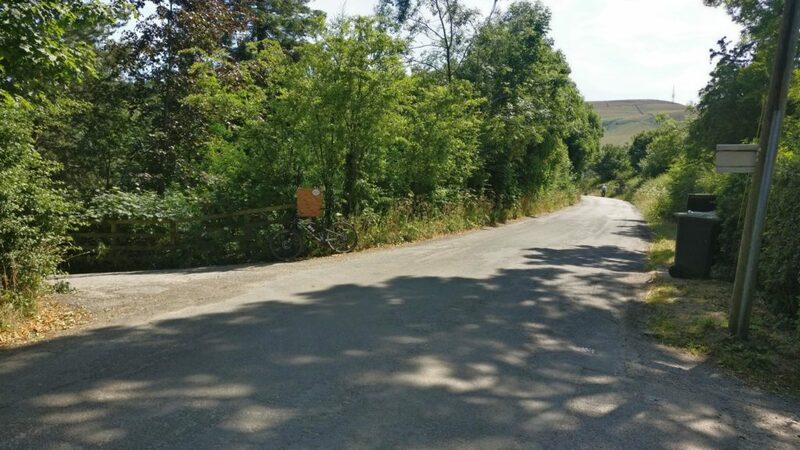 The next climb is up to Rowlee Farm, the crossing over the A57 is fairly clear but be extra careful when listening out for cars as it is a fast road. The Rowlee Farm climb is all tarmaced but is quite significant as it covers almost 250ft in just under one mile. Once at the top of the climb the route turns right and heads down towards the Hagg Farm descent, signs are at the top of the climb showing the direction to Hagg Farm. 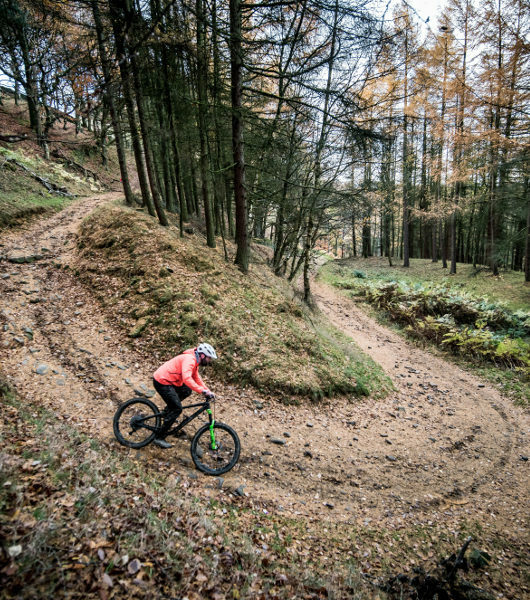 The Hagg Farm descent is a brilliant offering of five deep wide berms working their way into the woods for a finish on a rocky descent similar to Spud Alley but a little more tame, this descent makes for some brilliant pictures just be aware of the gate at the start of the woods. Once at the bottom of the descent it’s time to cross the A57 again and head down to the bottom of The Beast taking a left on the first significant right hander, from here the route follows the reservoir firetrack for just shy of a mile before climbing up the horrid climb (Strava name isn’t so PC). After the horrid climb the route takes a left towards Win Hill before dropping down the Aston Bridleway into Aston then following Thornhill Lane and turning left onto Water Lane, this is an easy turn off to miss so keep an eye out for the wooden post with the white sign on it (See picture below). After following Water Lane for half a mile turn right into the Thornhill Recreation Ground and back into the Garden Center and Bike Garage. This loop is a really good day out and is currently running the best it has been for a while. 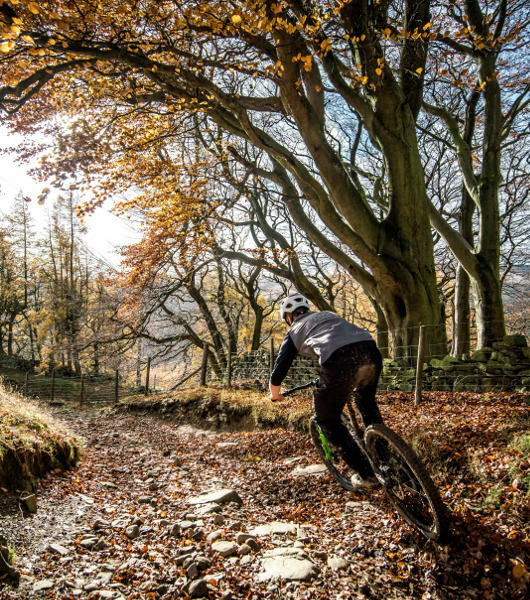 It covers 20 miles over 3,000ft of climbing with four solid climbs and four rewarding descents ranging from wide rocky trails to tight singletrack. 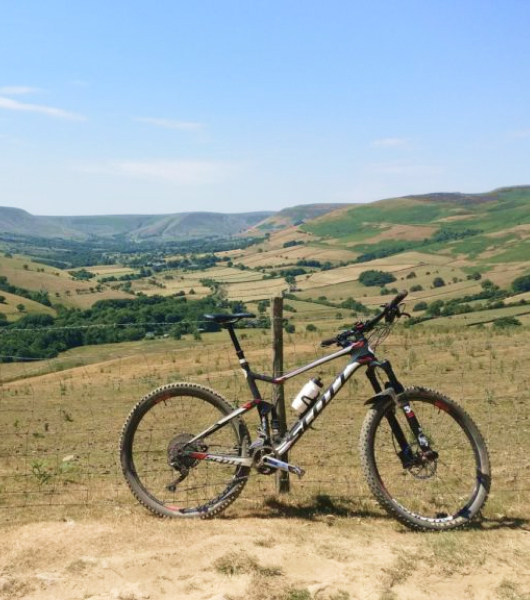 The views over the peak district from the Roman Road are of the best in the Peak District and the option to stop in Hope for refreshments makes it perfect for someone wanting to take it steady and make a day of it as well as those who want to push themselves. Turning onto Water Lane after the drop down from Thornhill. Want to explore this route? Book your bikes online now!